Disorganized closets, messy drawers, out-of-date resources… It is a lot to tackle when you, like all other teachers are feeling overwhelmed, crunched for time, and more increasingly stressed by the demands of the job than ever before. Even when you find a few moments to spare before or after school and take the time to try to organize your classroom, it often feels like you are not making progress even when you are. As a teacher, you have an overwhelming amount of responsibility and it is easy to accumulate tangible and mental clutter...which only adds to that feeling. 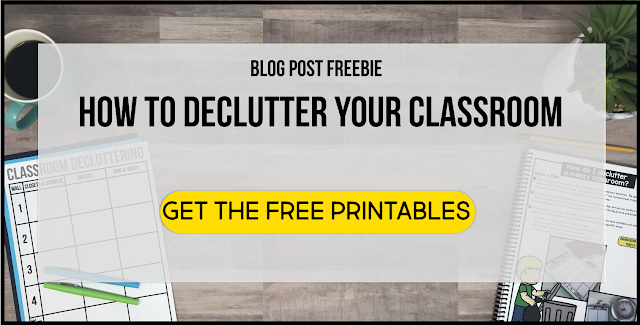 I have worked with so many teachers just like you and am excited to share one of my simple tips for helping you tackle the clutter in your classroom in a systematic manner and to guide you towards becoming an even more organized teacher. The key is to not just jump in and try to tackle the clutter right away. Instead, take photos of your classroom as it is. This will help you approach the task in manageable steps. 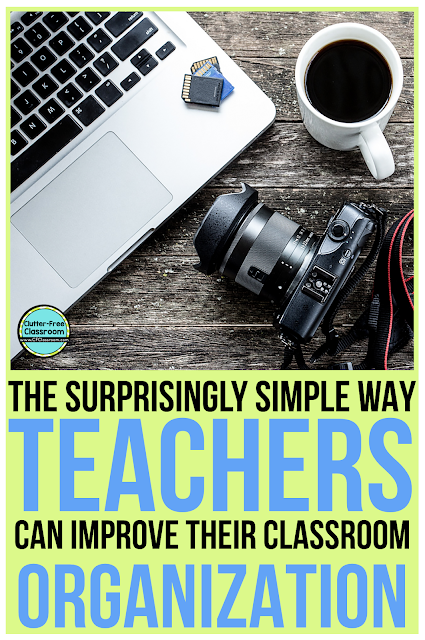 Taking before photos is a key step in making your disorganized classroom a space you love teaching in and are proud to call your home away from home, but most importantly is conducive to on task student learning. Think of the journey to an organized classroom as a sprint, not a marathon. It is overwhelming to think about taking on an entire room, but a drawer, a shelf or even a closet is manageable. With that strategy in mind you will be taking both large scale and closeup before photos. Taking before photos of your classroom in its current state is a valuable tool for transforming it into a clutter-free classroom. It may seem silly to snap pictures of the space instead of just jumping in an organizing it, but there really are many benefits to documenting where you are starting. It offers a different perspective: Your eyes don’t register the reality of the situation. You spend hours in your classroom every single day and, as a result, things begin to blur together and not register as they truly are. Taking ‘before pictures’ removes you from the environment and enables you to see your classroom in its true state. Looking at things from this perspective will let you see things out of place, identify problem areas you may not notice in ‘real time’ and approach the overall task of improving your classroom organization with a critical eye. It provides motivation: Before pictures provide a baseline and will continue to motivate you throughout the process. 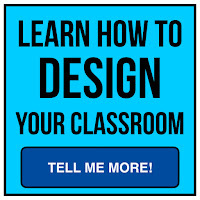 Taking your classroom from its current state to the desired clutter-free, super-organized state is not going to be easy, but it will be well worth the time you will need to invest. Having those starting point photos to reference will enable you to see the progress you’ve made and will provide encouragement to continue on the journey. It ensures you have the documentation you need. It will serve as documentation for your taxes. If you are planning to donate a lot of the unwanted items you can claim those things as charitable donations on your taxes. It is helpful to have good documentation for that purpose. It creates a sense of pride. It feels amazing to compare before and after photos when the work is done. 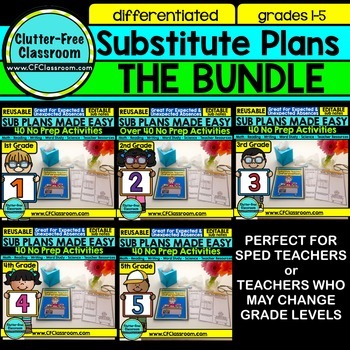 Not only will you enjoy the benefits that come from teaching in a clutter-free classroom, but you will experience even more pride when you see a side by side comparison of how far you’ve come. Start in one corner of the room. Stand as far back to the wall as you can. Snap a picture of the opposite corner. Rotate clockwise around the room taking pictures from the center of each wall as well as each corner. When you return to the starting corner, make a second rotation taking close-up photos. Open closets and drawers and photograph the contents. Take pictures of your desk or teacher workspace. Capture images of all the shelves and their contents too. 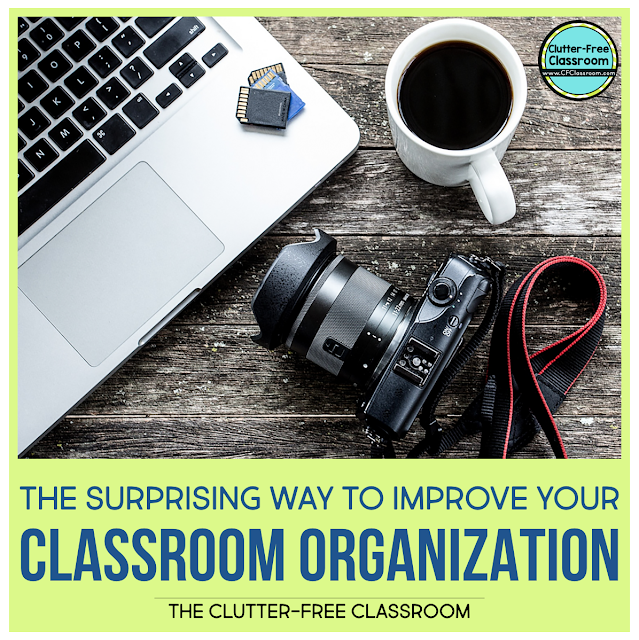 After you have taken before photos I suggest uploading them to your computer and storing them in a file titled “Classroom Organization Process: Before Photos.” This will not only make them easy to find but creates a positive mindset around those photos. 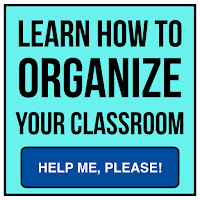 The name reflects your goal of an organized classroom while at the same time reminds you that it is a process. Take time to look at the pictures when you are away from school. Look at them as if you are a visitor in your own classroom seeing the space for the first time. What do you notice? What is out of place? What do you think looks most cluttered, disorganized and in need of your immediate attention? Ask for outside opinions from friends or family who will be honest with you. Show them the photos and solicit their thoughts on what they first notice when they look at the image. You can even use social media to post a photo and ask for feedback from others. Do you immediately see things that don’t need to be in the space? 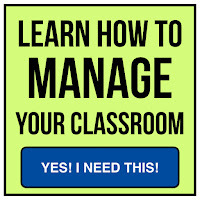 (textbooks you no longer use, boxed thematic units you no longer have time to teach, an old overhead projector that has been replaced by an interactive whiteboard? Do you see multiple items that serve the same purpose? Are there things in the space that would be distracting and could take a child off task from learning? Determine the order you will attack each space by making a list where you prioritize each section. Begin with the first section on your list and work your way down until you have reached a clutter-free classroom. Remember this is not a race. Take your time and cross off each area as you complete it.